Disney Springs, formerly Downtown Disney, has taken on a life of its own as a must-visit attraction for an Orlando trip. Even for tourists not interested in visiting Disney World, Disney Springs has evolved into a staple of the city, with something for people of all ages. With unique shopping and dining experiences alongside a beautiful theme-park inspired landscape, Disney Springs creates an experience that blurs lines and shatters expectations. To make the most of your time at Disney Springs, here are nine tips you should follow. Disney Springs has its share of unique attractions to truly mark the occasion. There are several places that offer fun and excitement that you should plan for. One of the most popular is Splitsville, a retro-themed bowling alley that serves great food. If you’re looking to get a game in, it’s best to go during the day as the lanes may get crowded at night. The show La Nouba is a breathtaking Cirque du Soleil performance created specifically for Disney Springs. There are usually two shows on a given night. La Nouba will be closing their doors in 2018, but given the Cirque’s relationship with the Mouse, there should be something new and special on the horizon. 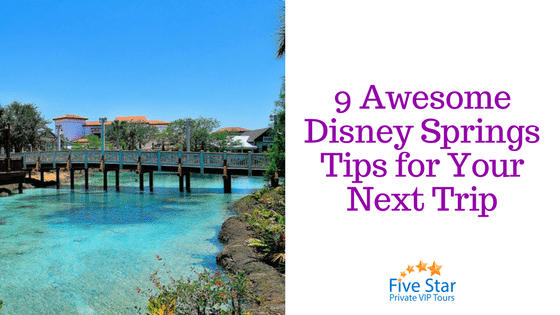 A Private VIP Tour of Disney will help you maximize the experience of visiting Disney World. Disney Springs is no different. With a Private VIP Tour you can explore all the attractions and amazing areas for shopping and dining. For more information on how Five Star Private VIP Tours can bring Disney Springs to life, please contact us. The Amphibicar is docked next to The Boathouse. This vintage-looking car drives directly into the water and rides across the surface for about twenty minutes. You can’t go wrong taking a nighttime ride in the Amphibicar. There are so many dining options to choose from. It’s best to make a reservation and plan ahead for dinner, because most get crowded fast, making for long wait times. Better yet, some places like The Boathouse and Morimoto Asia allow for reservations via OpenTable.com. For quick service food, you’re in luck. Disney Springs has some awesome places like The Smokehouse, Earl of Sandwich, D-Luxe Burger, and an armada of food trucks. You can eat well on the go and enjoy the next attraction. Disney Springs is an outdoor mall. Despite having indoor shops, there isn’t much shade or overhead protection to keep you dry from a downpour. Especially if you’re going between places, bring a poncho. Just do it. Ghirardelli, Goofy’s Candy Company, Disney’s Candy Cauldron, and Ganachery each have free samples of candy. Bring the kids. It’s not just treats either, Basin offers samples of scrubs and soaps that are pretty exquisite. The LEGO Store will let you build and race a custom LEGO car to see if you’re the fastest. Here are some exclusive places to check out at Disney Springs. The Marketplace Co-Op is a testing ground for new merchandise to be sold in Disney World. It features various limited production items as well. The World of Disney is an awesome establishment with twelve rooms covering a diverse range of all things Disney-related. The Lego Store is a must visit for your kids, especially if they are fans of Star Wars or Lord of the Rings. It’s an amazing place for imagination. Why do they call it Disney Springs? There is an actual story that involves springs and a bottling company that opened to distribute water. You can find more about the story in the Visitor’s Center of the Town Square. The hot spring was once a very popular tourist attraction. Throughout Disney Springs, you’ll find various vintage water bottling signs paying tribute to this history. Disney Springs has evolved into such a staple of Orlando that you don’t need to visit the other parks to enjoy it. If you’re looking to enjoy the parks, as well as the springs, to the fullest, we recommend contacting us for a private tour experience like no other.